France, perhaps Provence, ca. 1470-1480. 20th-century blue morocco, gold inscription on spine Preces piae, gilded edges. Purchased on the Charles Ryskamp Acquisition Fund and the James H. Heineman Purchase Fund, 1997. New Brunswick Theological Seminary, New Brunswick, N.J.; purchased on the Charles Ryskamp Acquisition Fund and the James H. Heineman Purchase Fund in 1997. Ms. book of hours, use of Rome (Hours of the Virgin, Office of the Dead) calendar for Provence; written and illuminated in France, perhaps Provence, ca. 1470-1480. 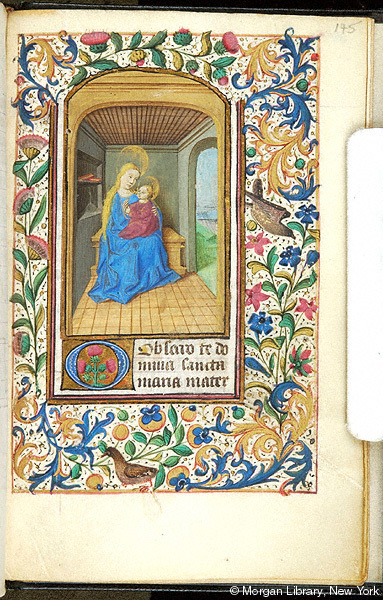 Decoration: 5 miniatures with full borders, 9 pages with partial borders and large decorated initials. Heraldic device in the border of fol. 21r: mounted knight in gold armor on horse in lilac and blue caparison, purple shield with cross or arrow tip; hybrid figure with purple pennant with three vertical crosses or arrow tips. 19th-century floral and zoomorphic decoration added to the Calendar section, fols. 1r-12v. Artist: miniature style close to Enguerrand Quarton and the Master of Rene II, known as Georges Trubert.